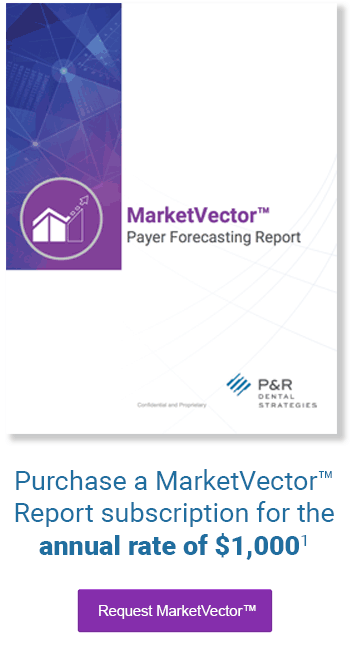 MarketVector is a new report from P&R Dental Strategies that that leverages our cross-payer data warehouse and proven analytics to provide historical and 6-month predictive trends for actual cost per treated patient, price per treatment and treated patient utilization as well as insights and observations about these trends. The MarketVector Report is delivered twice annually, however, we update our data and process it through our analytics tools and projection models each month so that we can constantly refine insights for upcoming releases. The report was developed especially with actuarial and underwriting professionals for commercial dental plans, programs and insurance companies in mind. Finance professionals and those who develop products and plan designs for their organization may also find interest in the historical market trends and projections available in the report. What do you get with each MarketVector Report release? Which of the three trends (price, utilization, and cost) is comparable to the trend we use in pricing? Cost trend is considered the aggregate trend used in pricing. It is made up of both price per treatment trend and utilization per patient trend. Does the relationship between in-network and out-of-network costs in the MarketVector report reflect the “effective” discount achieved by the average marketplace network? Yes, the difference between in-network and out-of-network cost per patient is the “effective” discount achieved by the average marketplace network. For example, if the in-network cost per patient for a given experience period is $435 and out-of-network it is $450, then the “effective” network discount is 3.45% (i.e. $450/$435 — 1). This “effective” discount includes the combined impact of both price and utilization differences between in-network and out-of-network services. The report rate is $1,000 annually which includes two reports, one every six months. 1 The price of an annual MarketVector™ Report subscription is $1,000 with an updated report sent twice per year. Additional terms and restrictions may apply. Contact P&R Dental Strategies for details. 2 Pricing for a customized MarketVector™ Report varies depending on your objectives. Contact us to begin a discussion.